CALIFORNIA: Gay Death Penalty Ballot Measure Will Probably Be Advanced - Joe.My.God. The state Supreme Court has the power to keep measures off the ballot if they violate the California Constitution. It has exercised that power to disqualify measures that cover more than one subject, broadly defined, and to block last year’s attempt by legislative Democrats to seek a statewide advisory vote on a U.S. constitutional amendment that would limit corporate spending in federal elections. Presumably the justices could locate a state constitutional provision that would discourage shooting people in the head. But McLaughlin’s measure is currently before Harris, whose options appear to be limited. 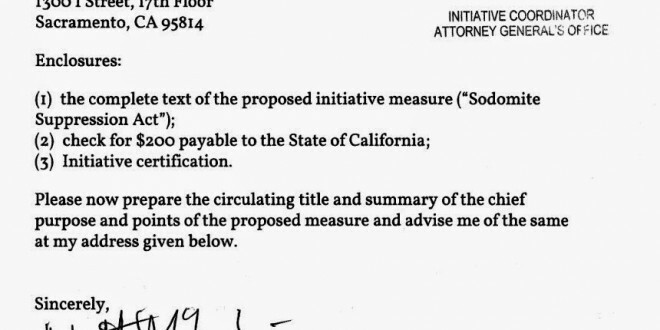 Once the sponsor has paid the required fee, state law directs the attorney general to prepare a title and a maximum 100-word summary of the initiative and forward it to the secretary of state for a 90-day period of public signature-gathering. The secretary of state’s website says Harris is scheduled to take those actions by about May 4. Does she have the power to refuse if the measure is patently unconstitutional? Harris isn’t saying; her office did not return repeated phone calls. But some veteran practitioners of election law said they don’t think so. “The statute is clear: that the office has to prepare a summary provided the proponents have paid $200 and followed the right procedures,” said attorney Robert Stern, author of the state’s 1974 Political Reform Act. He said he’s never heard of a case in which the attorney general refused to issue a title and summary. The ballot measure briefly vanished from the AG’s official website earlier this month, but soon reappeared. The proposed referendum includes this stipulation: “Any person who willingly touches another person of the same gender for purposes of sexual gratification shall be put to death by bullets to the head or by any other convenient method.” Jesus is love.